The labyrinth form can be realized in many ways. 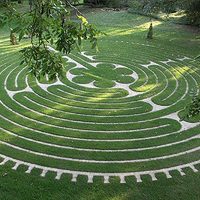 We create labyrinths that are unique to each client and site and believe the setting is as important as the labyrinth design and draw from our experience as garden designers and builders to achieve a ‘sense of place’ for each installation. Our designs have included hedge labyrinths and mazes, timber decks, pavior and turf labyrinths in classical, medieval and contemporary forms. Hand painted in our studio at Canterbury, England onto polyester-cotton canvas in a wide range of colours, designs and sizes. Bespoke commissions are also welcome. 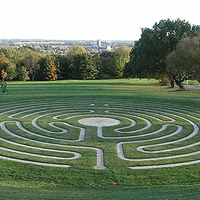 Cut into the slopes below the University of Kent and overlooking Canterbury Cathedral, this labyrinth enjoys a breathtaking setting. The original seven circuit design by Jeff Saward and Andrew Wiggins is in the medieval four fold style. A turf labyrinth ‘in reverse’ the paths are formed by York stone paviors and the walls by turf. Our Silver Medal Winning Labyrinth Garden at the 2007 Hampton Court Flower Show. A three circuit pavement labyrinth created in exquisite detail using bespoke natural stone paviors forms the centrepiece of an elegant courtyard garden. A commission (in collaboration with Jeff Saward) set in the beautiful grounds of Tofte Manor near Bedford, England and Highly Commended in The Annual Association of Professional Landscapers Awards 2006. 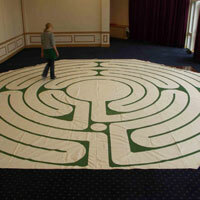 The Labyrinth is a 114% scale replica of the medieval pavement labyrinth in Chartres Cathedral. The original masonry forms are replaced by bespoke moulded paviors forming the ‘walls’ and grass pathways. 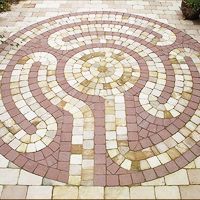 The Labyrinth Builders is a specialist division of Haywood Landscapes Ltd., a family owned and run business and founder member of The Association of Professional Landscapers (A.P.L.) through which the company has achieved the Government endorsed ‘TRUSTMARK’ status. The A.P.L. operates stringent vetting procedures for membership and continual assessment to ensure the highest standards are maintained.